You’ve heard of a pro shop at a golf course. But how many hockey arenas are lucky enough to have their very own hockey pro shop right off the ice? East St. Paul arena, just past the Winnipeg perimeter off Hoddinott Road, has their very own pro shop. It’s called the Hurricane’s Pro Shop. If you arrive at the arena on any regular hockey day, you’ll see youngsters in hockey jerseys, chasing the puck on the ice as you enter the arena through the main doors. Inside the front doors, you’ll find the canteen to your left, buzzing with hungry young hockey players and their families. Keep moving forward and push through the second set of doors towards the ice and take a hard left. Before you hit the bleachers lined with parents and their paper coffee cups, you’ll find the entrance to the cozy little pro shop in the north-east corner of the arena. What’s in a hockey pro shop? 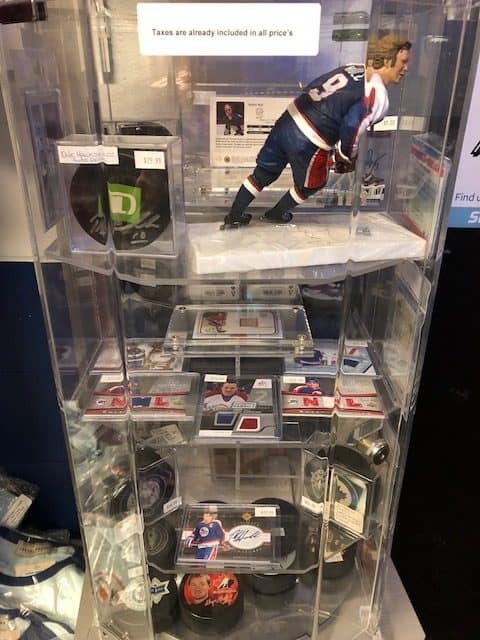 Inside Hurricane’s Pro Shop, you’ll find Winnipeg Jets cards, NHL team memorabilia, card collecting supplies, t-shirts, jerseys, baseball caps, hockey pucks, and used skates. Skate sharpening is also available, and a very convenient option for the hockey players in and around the East St. Paul community. One of the best things about Hurricane’s Pro Shop is their huge selection of used skates, all lined up neatly along the wall. 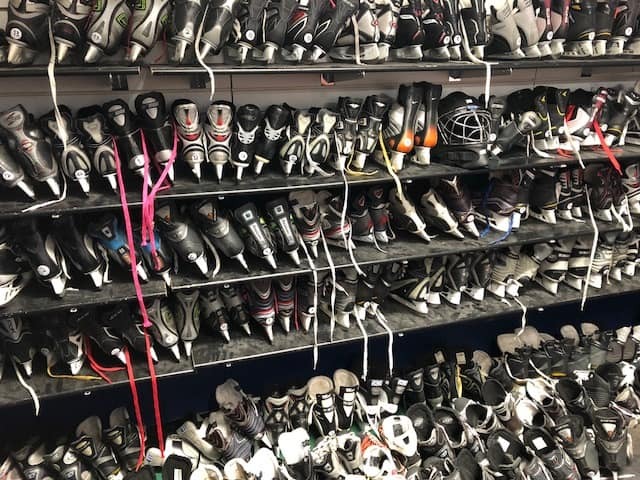 The amazing thing about the shop is that there is absolutely no smell in it that would indicate that they carry dozens of worn pairs of skates. They also carry used hockey helmets, some in nearly new condition, and other used hockey equipment from time to time. 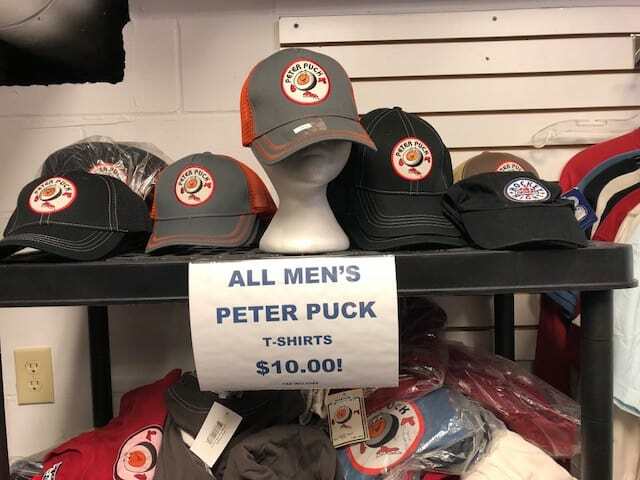 Hurricanes has a large selection of Peter Puck t-shirts. After CBC was done with the animated character, Hurricane picked up hundreds of brand new Peter Puck shirts, sweaters, and baseball caps. 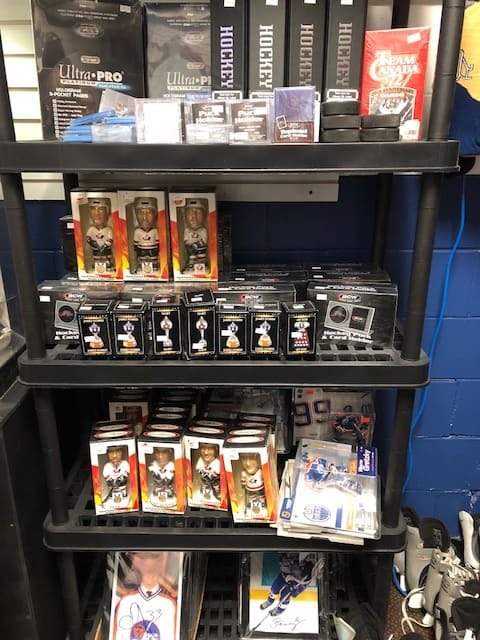 If you’re in need of a gift for the sports fan in your life, come down to the pro shop one weekend during hockey season and take your time browsing through the friendly little store. The pro shop has a bit of a nostalgic feel to it. When I was there, a boy around 8 years old came in gripping a 5 dollar bill and some loonies. He ran out a few minutes later, excited to have purchased a Hellebuyck jersey card for $10, tax included. Autographs and jersey cards of the Winnipeg Jets’ young stars. 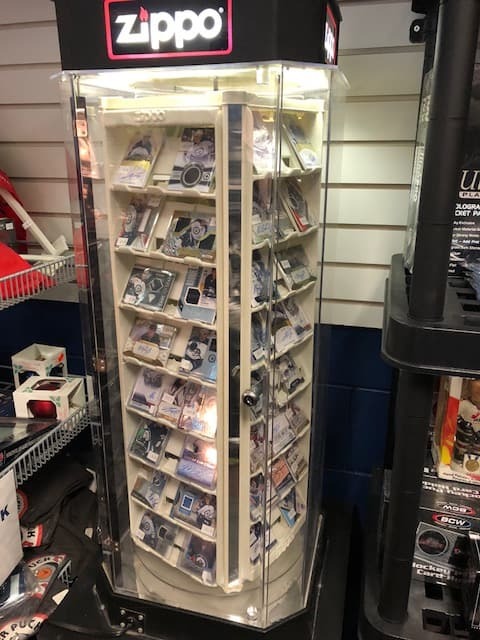 Young hockey players can come in to buy their favourite Winnipeg Jets player’s cards or unopened packs of MVP and OPC. Hurricanes carries affordable Winnipeg Jets cards including jersey cards and autographs of the Jets’ youngest stars. 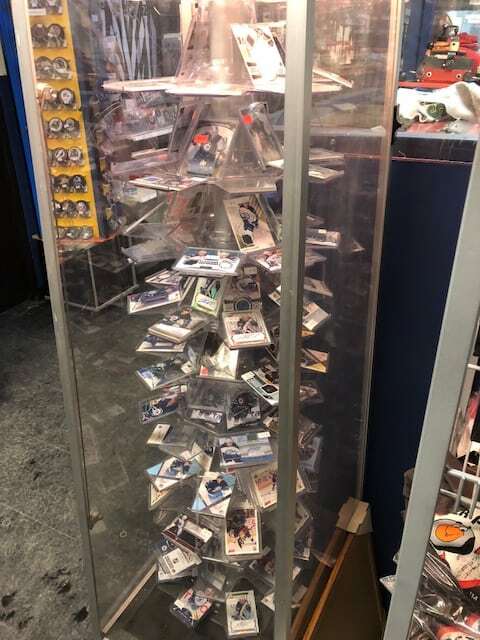 A small Dale Hawerchuk shrine showcases a variety of Hawerchuk cards, autographs, hockey pucks, and figurines. 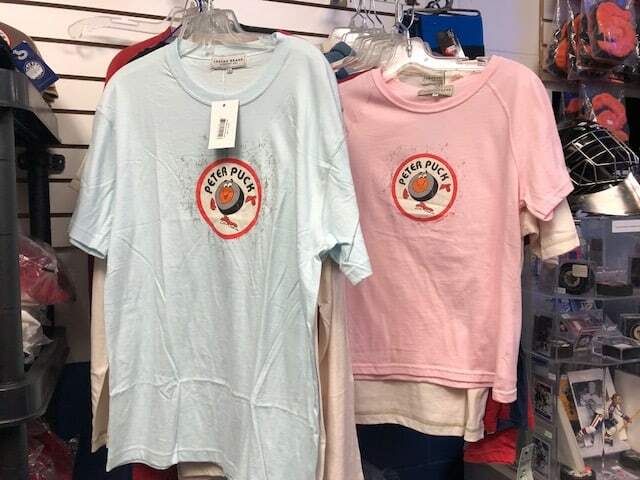 The Hurricane’s Pro Shop located in the East St. Paul arena has now closed for the season (last day of the 2018 season was March 18th) but will re-open with their regular 4-day weekend hours in the fall. You can still contact Hurricane Pro on Facebook and if you’re looking for used skates, watch the Hurricane’s Pro Facebook page for special openings in late summer as parents and kids gear up for a new hockey season. Call or text Hurricane’s at 204-451-2214.